It’s May, the sun is out and the trees are looking good! As well as their gorgeous spring finery, here are five things to love about London’s trees. London’s trees are as much a part of the capital’s human history as are its buildings. Take the London Plane, which is in fact a cross between the American sycamore and the Oriental plane. So, we owe its existence to the plant collectors who sailed across the world hunting out new species in the C16th and C17th . The hybrid London Plane was first ‘discovered’ in a Vauxhall nursery over 350 years ago, but not planted en masse until the nineteenth century. Its popularity was a reflection of just how polluted the city had become. With their peeling ‘self-cleansing’ bark, Planes could thrive where other trees were dying. Examples from that period include the giants that line the Victoria Embankment. They were placed there in 1871, a year after the Embankment itself was created to accommodate London’s new interceptor sewer. They connect us to the rest of the world. There are some 500 different species and cultivar of street tree in London, according to Paul Wood, author of London’s Street Trees: A Field Guide to the Urban Forest. Like Londoners themselves, they hail from all over the world. Where I live, for example, a five minute walk will take you past Himalayan cedars, Oriental gingkos, American sweetgums and a Mediterranean cork oak. The shift away from native species reflects a deliberate policy to plant trees that are better suited to London’s changing climate. They take us out of the rush, and give us a slower sense of time. London, with its rushing crowds, high-rise building frenzy and love of the new, can feel exhausting. And then there are the trees: quiet reminders of slower currents in the city – of seasonal change, of hundreds of years of growth, and of life before humans. Take Magnolia trees. The Magnolia genus is so old that it pre-dates not only us but also bumble bees. It is thought that the reason its flowers are so large and open is because the plants evolved to encourage pollination by flying beetles! They help keep us cool. London is an urban heat island. In high summer the city centre can be up to 10oC warmer than the surrounding countryside. That’s mainly due to all the reflective hard surfaces, as well as waste heat from cars and air conditioners. Thank goodness there are trees to shelter under. A recent study found temperatures in the shade of giant Planes were 10oC lower than in the open street. Trees also absorb carbon dioxide, helping to slow the pace of climate change that will mean even hotter summers in the future. They make London sound better. With its constant enveloping hum of traffic, London can be noisy and dull on the ear. Dense evergreens can help shield the noise. And when the wind blows, trees add diverting rustles, whistles and hisses to the city’s soundscape. By attracting birds, they also introduce song. So, tree planting is becoming a feature of London local authorities’ ‘noise strategies’ (yes, this is a thing). 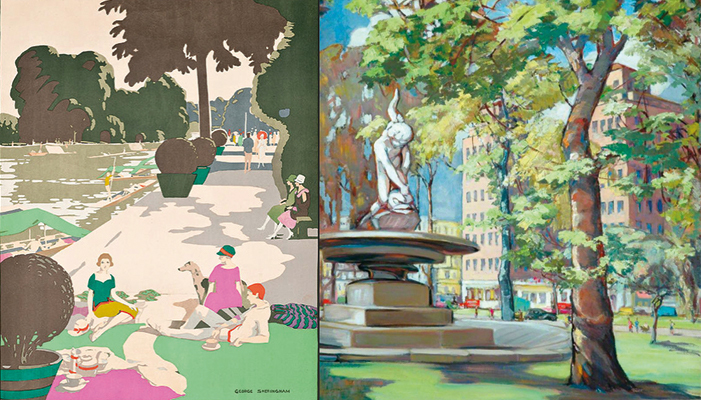 Images: Hyde Park by Edwin Harris (British Railways Poster Artwork); Upriver by George Sheringham (London Transport Poster Artwork).